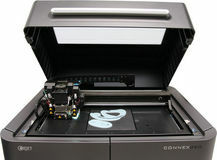 The Objet350 Connex� is a 3D printing system that jets multiple model materials simultaneously. 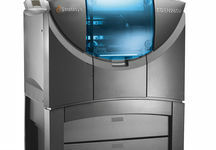 It offers the completely unique ability to print parts and assemblies made of multiple model materials, with different mechanical or physical properties, all in a single build. Build mid-sized 3D printed prototypes in multiple materials. 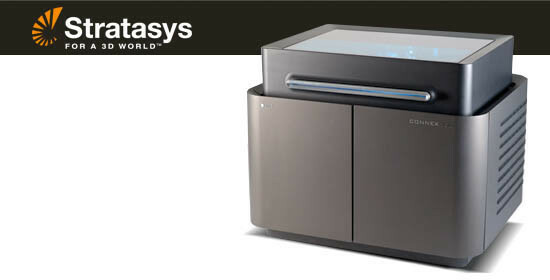 The Stratasys Objet350 Connex festures multi-material 3D printing technology, with a mid-sized build envelope. Comprehensive 120 materials to choose from, the Objet350 Connex turns your designs into stunning, high-precision, realistic prototypes. Using pioneering PolyJet multi-material 3D printing technology, the Connex350 creates stunning prototypes that are amazingly similar to finished products. Printing as many as 14 material properties simultaneously in a single part, to eliminate time-consuming assembly. With its 350 × 350 × 200 mm build tray, the Objet Connex350 gives you the power to prototype complex, assembled products. Like all Objet Connex 3D printers, it offers outstanding 16-micron, high-resolution layers for printing complex geometries, smooth surfaces & ultrafine thin walls. 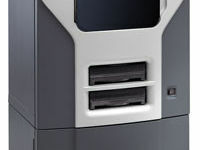 An unrivalled range of more than 120 materials, including more than 100 Digital Materials created as the model is printed, the Objet Connex350 enables you to simulate diverse mechanical and physical properties, from flexible rubber to rigid; opaque to transparent; and standard to ABS-grade. Create prototypes that embody your product vision down to the finest detail. The Objet Eden260V professional 3D printer works with 17 materials to deliver outstanding precision and productivity. Create large, high-quality prototypes Objet Eden 500V features the robustness and reliability of the Objet Eden line, as well as its largest build envelope. Fortus 250mc pairs fine layer resolution with a larger build envelope and gives you the power to fine-tune every aspect of prototype production. 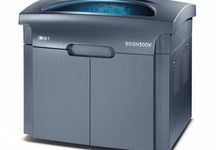 Optimise every part for strength, print time or aesthetics, all in an easy-to-use, office-friendly system.